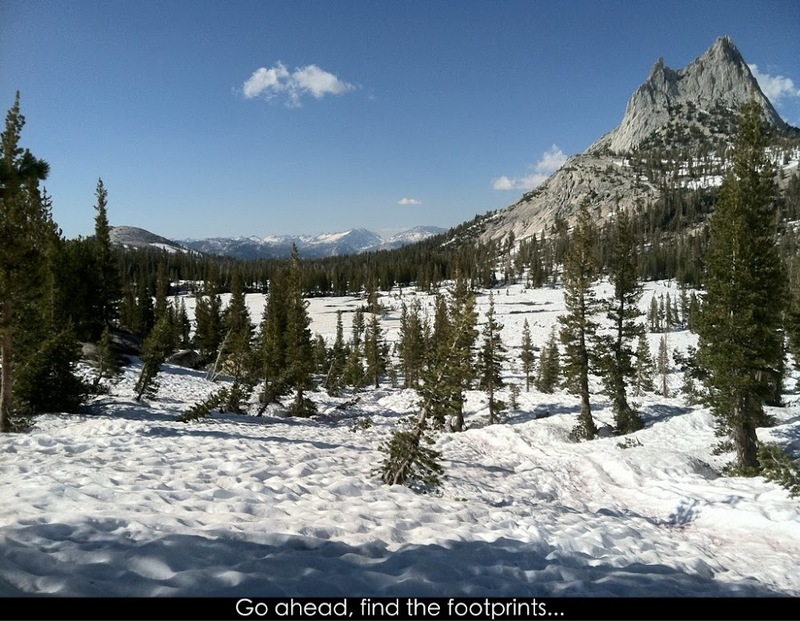 Day 66: JMT Reality Check! Let’s just say today sucked! Total bummer of a day. If today was a movie, I’d say it was a black comedy gone horribly wrong. Here’s why…Goose and I slept in today and were in such a great mood this morning. I haven’t intentionally slept in on the trail yet! The PCT this year has been pretty tiring and each day we’ve felt the pressure to get up early, do lots of mileage, and take few breaks. We were sooo excited to take a couple days off from the trail to finish the John Muir Trail, which we’ve be overlapping for the last ~180mi. We’ve heard this extra ~25mi is a great downhill side trip that includes the chance to do Half Dome, one of the things I’ve been dreaming about since day one on the trail. As we sat in our naive bliss, a JMTer walked by. The JMT hikers are just starting and they hike opposite us from north to south. We asked him how the trail was and he said a TON of SNOW! What!? How did no one tell us that!? Our relaxed state of bliss quickly diminished and was replaced with the stress of knowing that we were headed back into the snow. Had we known, we would have started hours earlier! We booked it and hoped the JMTer’s idea of snow was nothing compared to what we’re used to. Many of the JMTers we’ve seen over the past week have a different perspective of the snow than what we have after almost three weeks in it…this was not one of those hikers! He was right! The trail was clear for the first few miles and immediately became very deep and difficult to navigate snow. It was uphill too! Very uphill! About an hour into the hike, we came around a corner and two men were taking a break on a log. They immediately said, “It’s Erin!” It turns out they had been following my journal in preparation of their hike and they confirmed that navigation would be tough without GPS. They also saw Blister just ahead of us yesterday. It was great to meet you Dan and Mark! I did not have the JMT maps on my GPS, so we had to rely on map and compass…guess how that went…We made it through the first 6mi well and knew we were on trail. Then we needed to get over a wooded pass and we weren’t sure exactly where to descend. We saw some other JMTers coming toward us and asked them about the pass. One of them said, “Are you Wired?” His name was Green Rocks and he has done the JMT the past 8yrs and had also checked my journal for conditions on the passes. Pretty cool to be noticed in the middle of nowhere! Goose couldn’t believe it. The rest of the day became hours of route finding and getting NOWHERE. It was so frustrating, I only took two pictures all day. We had the map oriented and we knew how to read it, but there was no sign of footprints or a trail! There were large rocks all around us and we got to the point where we could convince ourselves that looking any direction made sense. We would descend hundreds of feet, not see anything that looked like a trail or footprints, climb back up, and then repeat the same process. It was so hot that when we turned around to follow our own footprints, they had already begun to vanish into the sun cups. Goose’s ankle somehow got tweaked and I postholed into a rock and got a good cut on my shin. All of this began to wear on us and our PCT egos were taking quite a beating. How could we not figure this out after almost 3wks in snow?! We were exhausted and didn’t want to give up. Around 4pm, we had to waive the white snow flag and return to the backpackers camp we came from before it got too late. The f-word was said more times today by both of us than ever before…our dream of Half Dome was just out of reach and that stung bad. Ten hours of exhaustive hiking with full packs just to return to our original campsite. We actually discussed yelling to get out our frustrations, but I was worried to waste the energy I needed to hike all the way back. It sucked! When we got 5mi from camp, we ran into Turbo and Furious hiking toward us. What!? They were supposed to be going north on the PCT today? They said their group got north, and from what they saw, and from having done this section last year, the crossings were way too high for their comfort. They have decided to do an alternate route that will be safer and parallel the PCT and the rest of their group moved on. Turbo was confident he could get us over the pass we came from and said it was really difficult for them last year. We were too beat up to hike back in there and I was concerned I wouldn’t meet my mom in time tomorrow, so we sadly had to pass on his offer. Total bummer, but I am glad I’m taking some days off at the right time while the water levels recede. When we got back to the campsite, Balls and Sunshine were there with their family, some JMT hikers, and Blister was there. Blister had just returned from successfully completing the JMT and and climbing Half Dome. He said that even with his GPS, it was difficult. 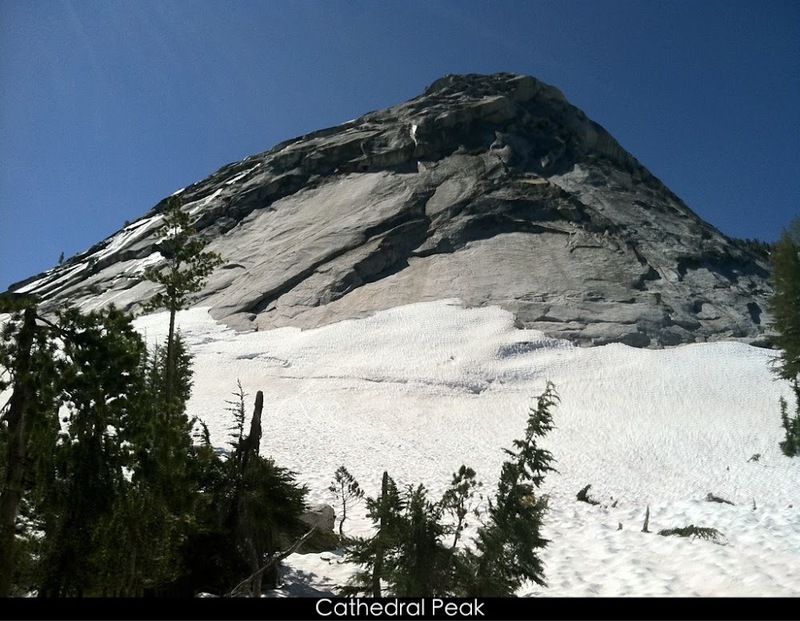 Hearing his description of Half Dome really makes me want to hike it, so maybe I’ll still find a way while I’m here. Also, after going to bed tonight, I had my first bear encounter. It had been spotted by Balls and Sunshine yesterday and tonight, it wandered into our tent and was scrounging around the picnic table. I heard it just a few yards from my tent and flashed my headlamp that direction and saw a brown furry thing run off. Then we heard someone further off in the campground yelling at it. I thought I heard it again around 3am…creepy! On a final note, as Goose and I walked back to camp tonight, Goose mentioned that he was looking forward to hitching into the valley and getting chocolate milk. I told him to go all out and get a milkshake. He said that after today, he’s going to aim low and not have high expectations so that when it doesn’t happen, he won’t be so disappointed. That seemed like a good end to how today went. Dang!